Kaiserslautern, Germany, Aug. 28, 2015 – Creonic announced today the successful product cooperation with the satellite supplier Aquila Space. Aquila Space will provide a daily multi-spectral satellite imagery through their Landmapper constellations. 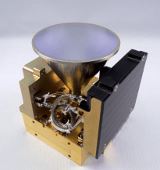 A new type of Ka-Band transmitter had to be developed, in order to send the data produced by the multi-spectral camera to earth and to fit to the need of a small power consumption, while maintaining a high throughput in nanosatellites. Creonic provides an efficient IP core to transmit UDP packets over a DVB-GSE and DVB-S2 link from space to earth. The solution includes UDP/IP packing into DVB-GSE and framing, coding and modulation according to DVB-S2. For a maximized flexibility and efficiency in throughput, seamless rate adaptation is included, providing a throughput up to 40 Mbps. For more information check out Aquila’s latest presentation given at the AIAA Small Sat Conference or at www.aquilaspace.com. Creonic and Aquila Space are looking forward to continuing their work, in pushing the throughput above 300 Mbps, designing the fastest Ka-Band transmitter for nanosatellites, by the end of 2015. Creonic is an ISO 9001:2008 certified provider of ready-for-use IP cores for several algorithms of communications such as forward error correction (LDPC and Turbo coding), synchronization, and MIMO. The product portfolio covers standards like DVB-S2X, DVB-S2, DVB-RCS2, DVB-C2, WiFi, WiGig, and UWB. The products are applicable for ASIC and FPGA technology and comply with the highest requirements with respect to quality and performance. For more information please visit www.creonic.com.